If your looking for an affordable Friday Harbor vacation rental you need look no further as you've found a comprehensive list of Friday Harbor vacation rentals available in town and elsewhere on San Juan Island. 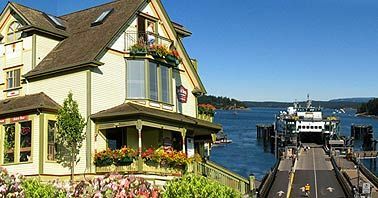 There are many benefits of renting a Friday Harbor vacation rental when compared to staying in other types of Friday Harbor Accommodations. The savings of renting a Friday Harbor vacation rental really comes when you are traveling with more than a few people. Renting a Friday Harbor vacation rental make less sense for smaller groups unless the vacation rental is also small and priced accordingly. Most vacation rentals in Friday Harbor include fully equipped kitchens so it expect to save lots of cash by cooking at your vacation home with family and friends. Try to find one with a hot tub and a bbq on the balcony. Then stop by Westcott Bay Seafarms ( near Roche Harbor ) to pick up some fresh oysters... they are fantastic on the bbq! Located on the west side of San Juan Island, this beautiful waterfront home was custom built with attention to the creative details. Built on a grassy beach within a stone's throw of the water, it is a very private island home whose secluded, sunny view of the Olympic Mountains and the Strait of Juan de Fuca is breathtaking in all seasons. The most premier whale watching on the west side of San Juan Island, there is 1,400 feet of coastline bordered by preservation land. Enjoy a front row view of the resident orca whales, who often sleep in the cove. This private, luxurious San Juan Island home just built in 2007 is set upon 5 acres and offers vaulted ceilings, bamboo floors and a great room that will take your breath away. The master bedroom brings the ultimate escape with a comfortable king bed, vaulted ceiling and fan, large walk-in closet, and you can indulge in the jetted bath or custom stone floor shower. Harrison House: Individually furnished private suites with all the amenities of home. Downtown Friday Harbor. Tucker House: Beautifully appointed Victorian guest rooms, suites, and cottages with private baths. Downtown Friday Harbor. Ferry Landing Suites is the closest Friday Harbor vacation rental to the ferry landing. Some rentals are located out of town so we recommend you bring your own transportation or be prepared to rent a car locally. Can I bring my dog/pet to a vacation rental on Lopez, Orcas, or San Juan Island? A candid article about finding a vacation rental in the San Juan Islands suitable for bringing along your pet/dog/iguana.